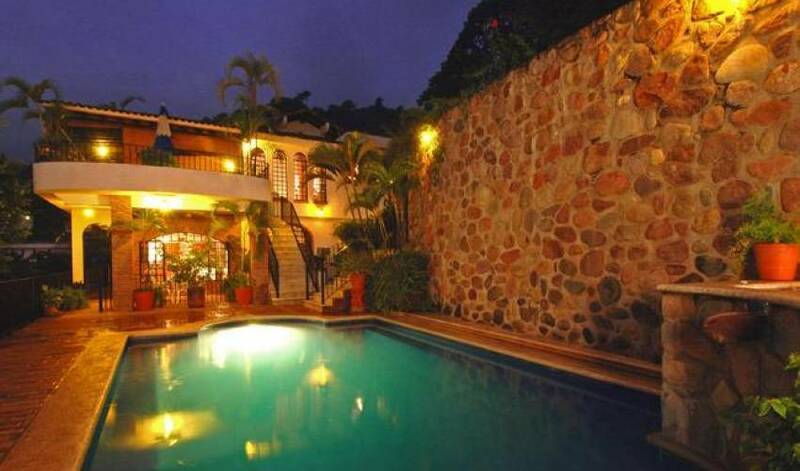 Villa 1504 is a very private 10 bedroom, romantic hillside hideaway, available for exclusive, private rentals of either 10 bedrooms (for a maximum of 20 guests) or 8 bedrooms (for a total of 16 people). We pride ourselves on our unparalleled location, spectacular views, spacious accommodation, great facilities, personal service and private candlelit dinner parties with sumptuously prepared high quality cuisine. 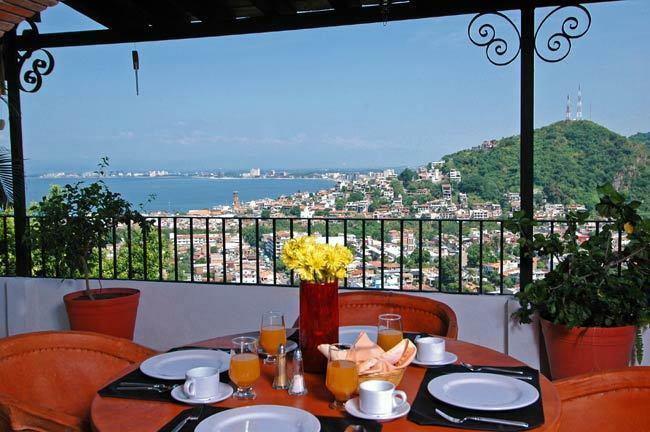 From our unique, hillside location, Villa 1504 offers unbelievable, panoramic views of the entire bay of Banderas and over 30 miles of lush coastline. 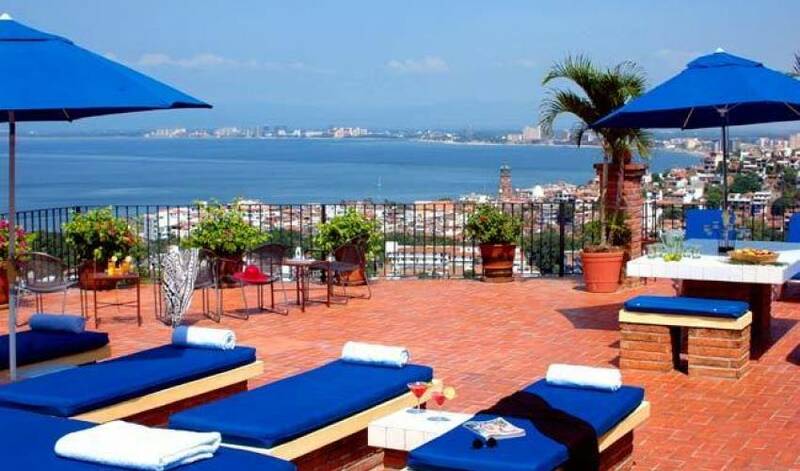 Our proximity to town also ensures breathtaking views over the quaint town of Puerto Vallarta with it's red roofed casitas by day and twinkling lights and firework extravaganzas by night. 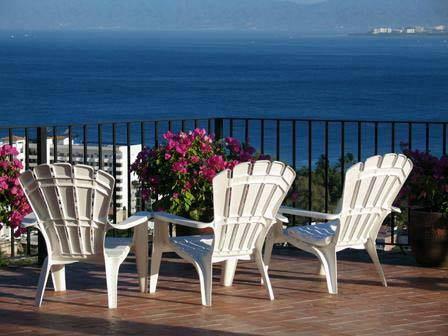 The villa is uniquely blessed with both glorious sunrises from the tropical mountains and incredible flaming Vallartan sunsets over the Pacific. 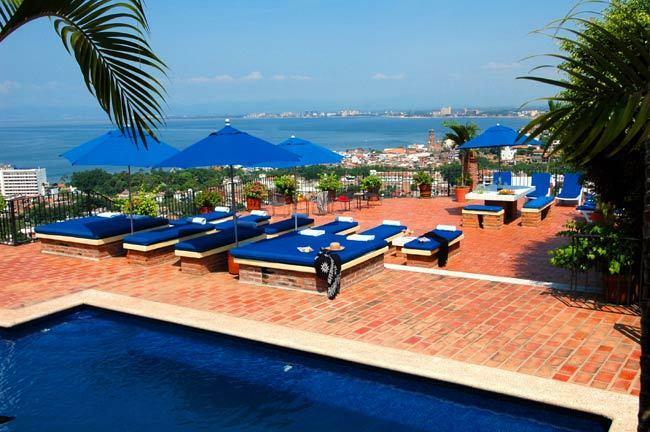 Nestled between the colonial seaside resort of Puerto Vallarta and the surrounding lush tropical jungle, the villa offers quick walking access to Puerto Vallarta downtown (2 blocks stroll), Los Muertos Beach (5 blocks away) and Conchas Chinas beaches (5 min taxi ride). 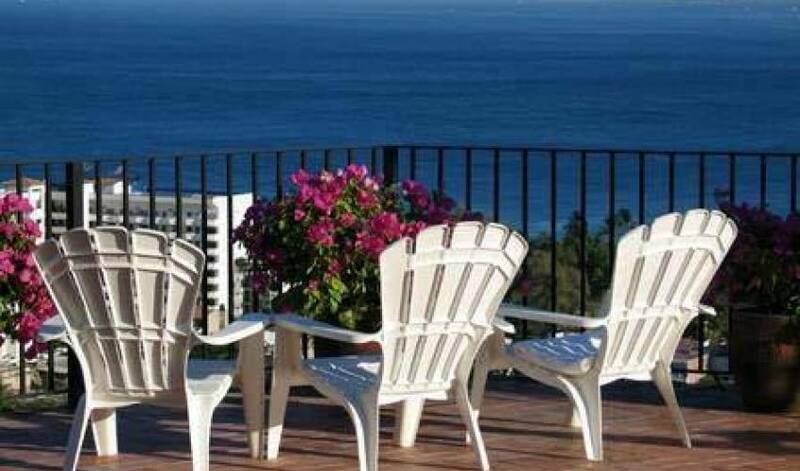 Our unmatched hillside location offers convenient access to all amenities while our elevation ensures privacy, spectacular views and tropically refreshing breezes. 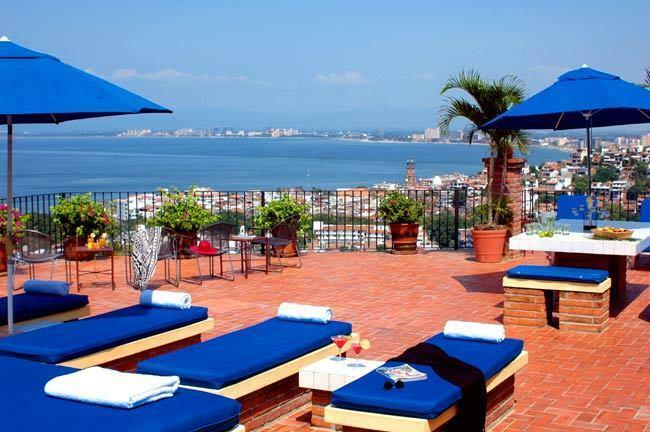 Our 10 bedrooms are spacious and individually decorated in traditional Mexican style. All beds have feather down European style comforters with all-white, high-count cotton bedding. 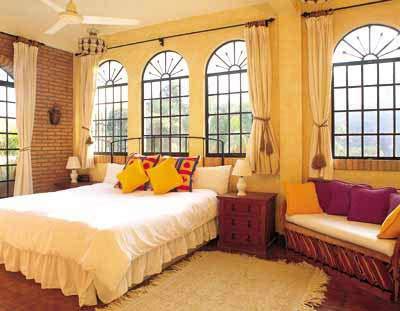 All rooms are individually air-conditioned and each has a lock up box for your valuables. All our bedrooms are non-smoking. 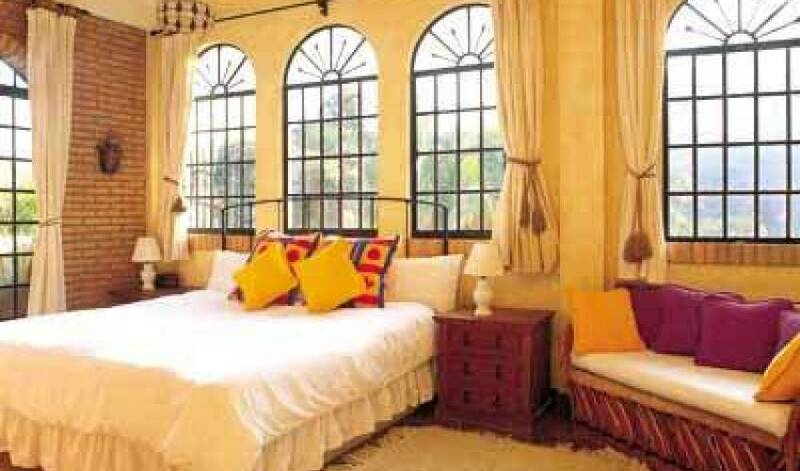 Our 10 bedrooms consist of 6 King bedrooms, 2 queen bedrooms and 2 bedrooms with twin beds. 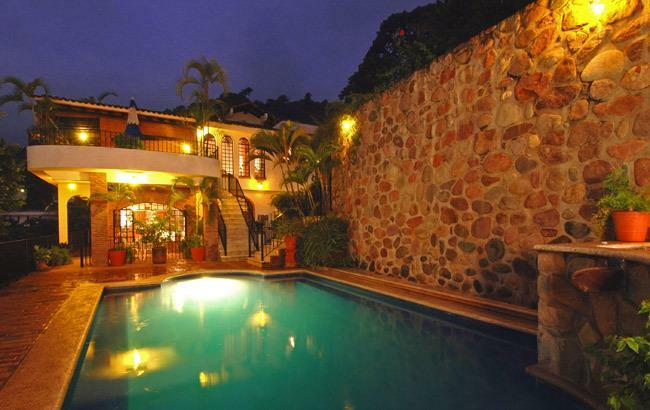 If you have reserved the villa with 8 bedrooms only, two rooms will be locked during your stay. 8 rooms have en suite bathrooms. 2 rooms share a bathroom. All bathrooms have large, all-tiled, showers/tubs. A floor plan of our villa, showing the bed layout, is available on request. This might make it easier for you to decide allocation of rooms and will make check in much quicker for you. The dining room offers unparalleled dining ambience with breathtaking views, candlelight and an amazing, specially designed, handmade iron and tile dining table to comfortably seat 16. 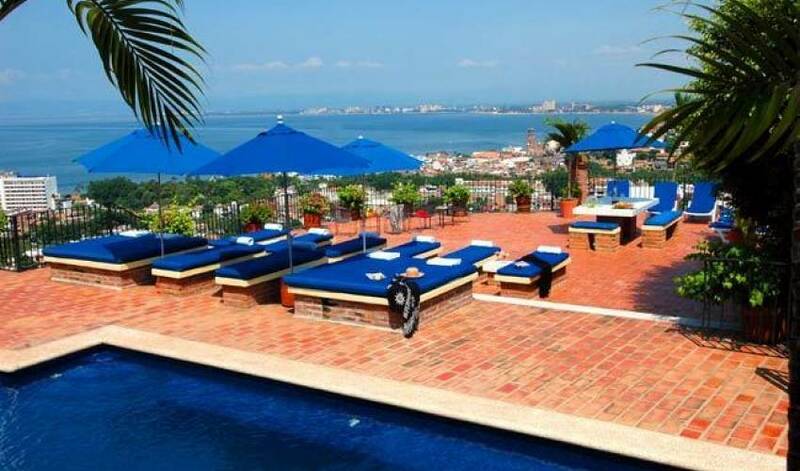 Amazing 1400 sq ft view and sun terrace, with comfortable sun beds and shade umbrellas, pool bar and offering 360-degree views of Vallarta. HDTV - DVD/CD with 5.1 sound surround and theater seating for 20. Upper road entrance for taxi drop-offs and lower street entrance for convenient, close access to town. Supreme Haute Cuisine: Privately catered full breakfasts and fabulous dinners. 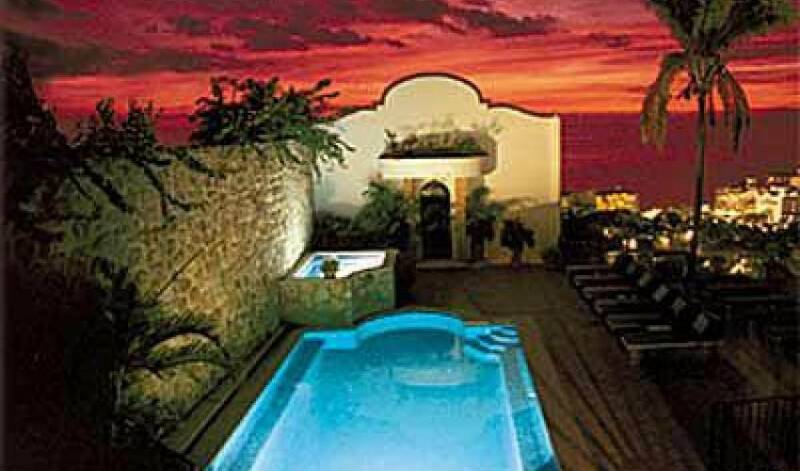 The villa is renown for its sumptuous, private, candlelit, dinner parties, prepared nightly our private chef and sous-chef. 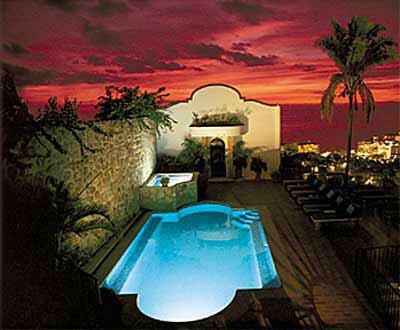 Full staff services included: Chef, Sous-chef, English speaking hostess, houseman/waiter and housemaid. 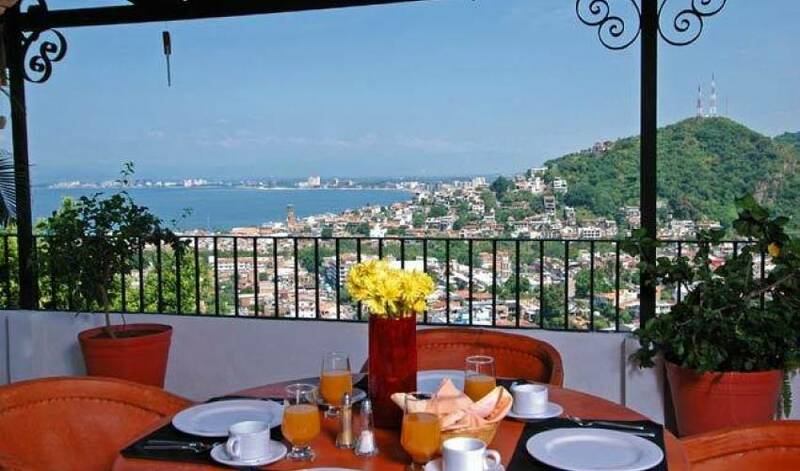 Invaluable local information available from our hostess who can also make reservations for restaurants,local tours, excursions, golf courses and tennis courts.